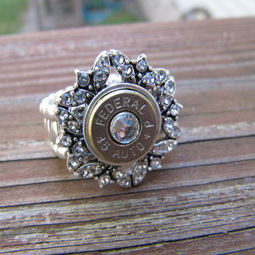 This ring is made from nickle plated .38 caliber bullets that have been tumbled clean and polished with a cloth to give a nice shine. In the center, a Swarovski crystal is placed to perfectly accent the piece. This silver plated filligree ring is fully adjustable to fit any finger. 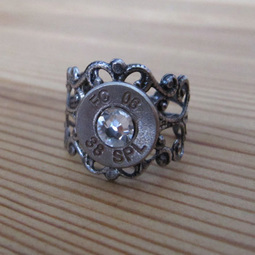 The .38 special bullet ring makes a great addition to any outfit. Each piece is hand cut and crafted to give a unique look.